The Vleague returned with one fixture this week, as T&T traveled to Bình Dương for a rearranged tie due to Hà Nội’s earlier participation in the AFC Champions League. For weeks I’d decided I wasn’t going to go, only to find myself aboard a Vietjet flight heading south to Saigon. HCMC is huge. I find it quite impersonal, especially compared to the compact and historic Hanoi. The main tourist area is Pham Ngu Lao; packed with cheap hotels, cheap restaurants, selling even cheaper beer and pumping night clubs that roll on until the sun rises. There are plenty of neon lights, Starbucks, McDonald’s and hosts of Burger Kings. The streets around the backpacker area are rife with vendors selling crappy bracelets that can also be found on the beaches of Thailand. HCMC seems more reminiscent of Bangkok than Hanoi. Saigon isn’t my favourite place to be, I headed out to Binh Duong. An overspill of HCMC, Binh Duong is industrial and kind of bland. Heading out on route A13 was like being part of some real life wacky races. The fast road merges on to the pavement where 4 year olds play on their bikes as huge trucks thunder past. Vendors turn large stretches of the road in to markets, again as trucks thunders past just a few feet away. The GÒ ĐẬU Stadium is beautiful, the best in Vietnam and recently was spruced up for the clubs participation in the 2015 AFC Champions League group stage. 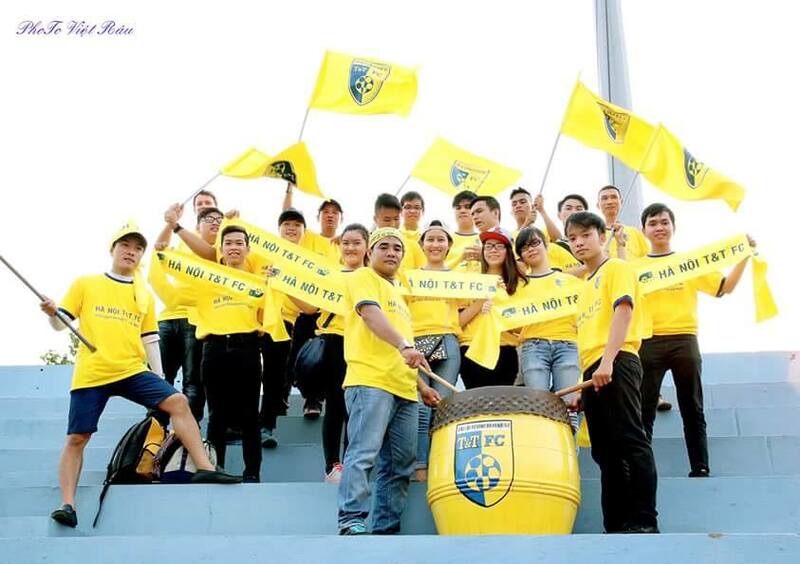 Binh Duong are the wealthiest teamin the country, with the likes of Le Cong Vinh struggling to get a regular starting place amongst a line-up that boasts Abiss, Anh Đức and Tăng Tuấn. 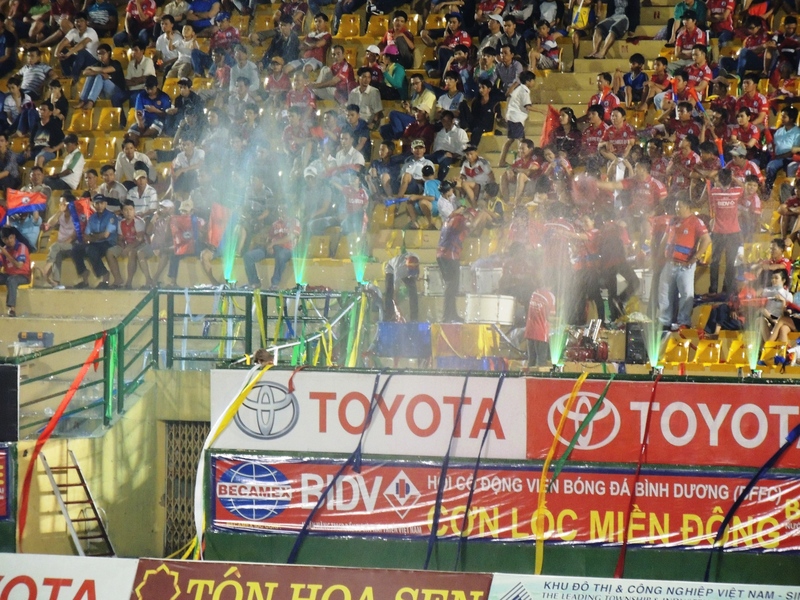 Hanoi’s lack of depth has been dramatically exploited this season. Today was only going to be worse. Star strikers, Samson and Gonzalo, are both serving suspensions. Van Quyet would have to lead the attack alone. Thanh Luong strangely warmed the bench. Prior to kick-off I was surprised to see a small group of T&T fans. The new Southern fan group. Another example of these new fan groups popping up out of nowhere. I recognized Thanh Thọ Phan, , the oldest of the group and they also knew who I was. ‘Hey, Bill Joorge’ I was quickly dressed in an over-sized yellow jersey and was making my way in to the stadium with them. I posed for the obligatory photos with the new fans. Pasty white and pouring with sweat, these not so flattering snaps were probably visible on various social network before the teams even entered the pitch. With the team deprived of its two star players, things got worse just three minutes in when Anh Đức opened the scoring for the defending league champions. This was bad. I just couldn’t see T&T scoring and figured a 0-0 was the best outcome. The game wasn’t great. The heat stifled the players in the first half. Hanoi failed to muster any clear chances and took another huge blow when Hector was rushed to hospital with an ankle injury after half an hour. The second half began in feverous fashion as the halftime banh mi’s brought some much needed energy to the terraces. The home fans continuously set off confetti machines and sent streamers down on to the pitch, while the southern T&T fans rose as one and noisily encourage their team to push for an equalizer. 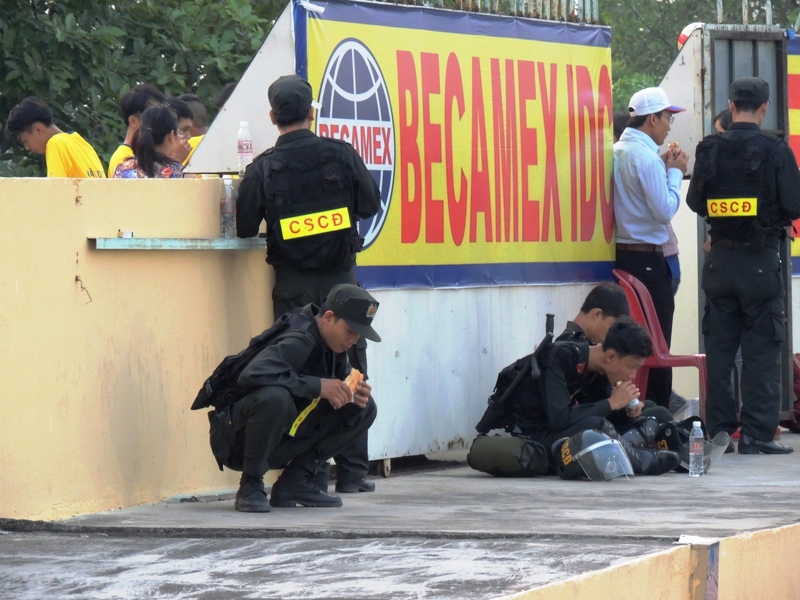 Binh Duong failed to impose themselves. Hanoi began to press and the chance of the game came as they not once, but twice crashed the ball against the homes sides’ crossbar. It was to be the closest Hanoi would come to an equalizer. The reigning champions held on for the three points, which in turn saw them move back to the summit of the Vleague. For me, I said goodbye to my new southern friends and gloomily began my journey back to HCMC before flying north. Next up: the big one. 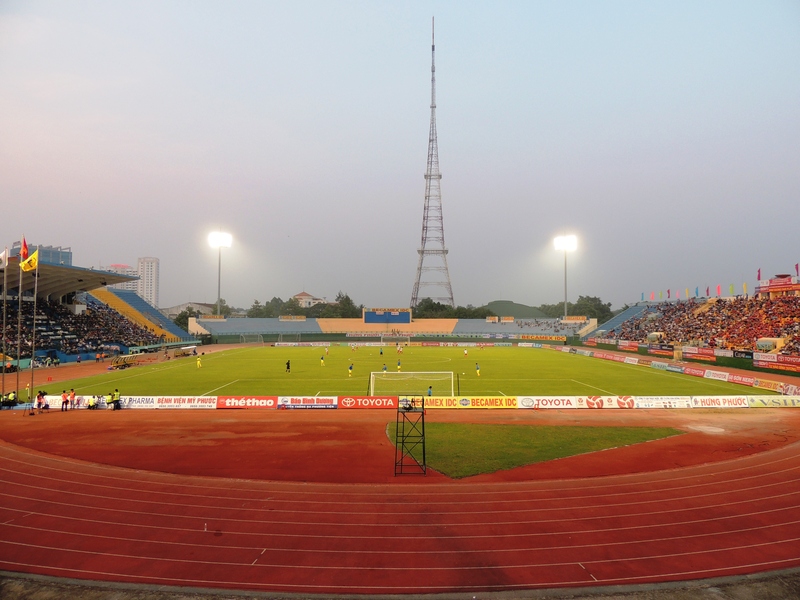 Locals rivals and inform Hai Phong visit the Hang Day stadium on Sunday.